Let’s be honest, muffins are just breakfast-approved cupcakes. But why does dessert get to have all of the fun? 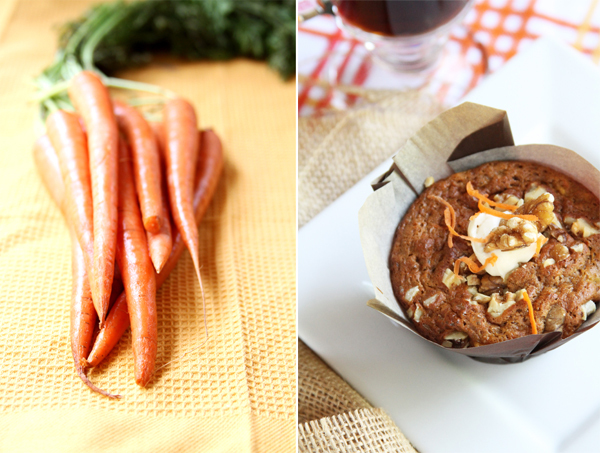 There’s really not an answer so we made one up in the form of a wholesome carrot cake muffin for breakfast. Trust us on this one. I don’t even like carrot cake, and it was all I good do to eat just one of these. So, maybe I do, in fact, like carrot cake? With spring’s arrival, it’s hard not to lunge head-first in to the freshest produce around. Carrots are an early arrival, ready for picking in April and throughout the summer months. Whether brunching, celebrating Easter, Mother’s Day, or just looking for a better weekday breakfast, these muffins are a bright addition to your menu! This recipe has all the components of a good muffin recipe and a good cupcake recipe and you get to have it at breakfast without any awkward self-doubt. 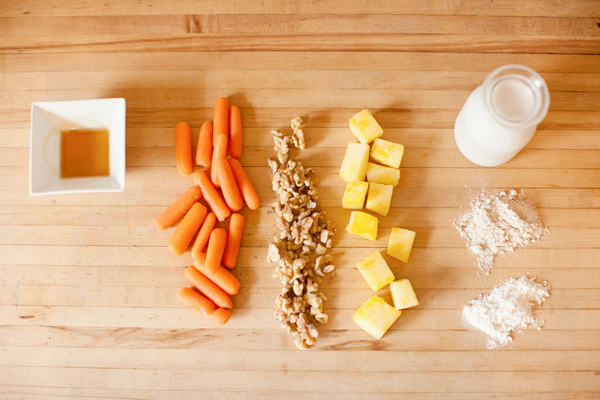 Wholesome carrots, sweet pineapple, and warm vanilla combine with whole wheat flour to make a pretty darn healthy muffin. When you fill the centers with a low-fat cream cheese frosting, garnish with crunchy walnuts, and bake in adorable papers, it could pass for a cupcake. 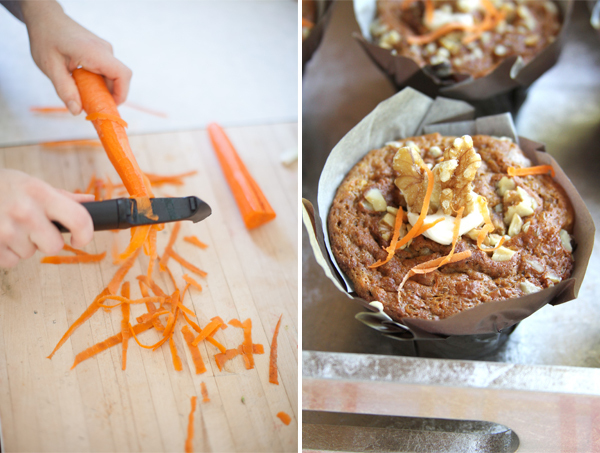 And you can skip the sprinkles; we use a lemon zester to make thin, pretty little carrot curls to finish these muffins. 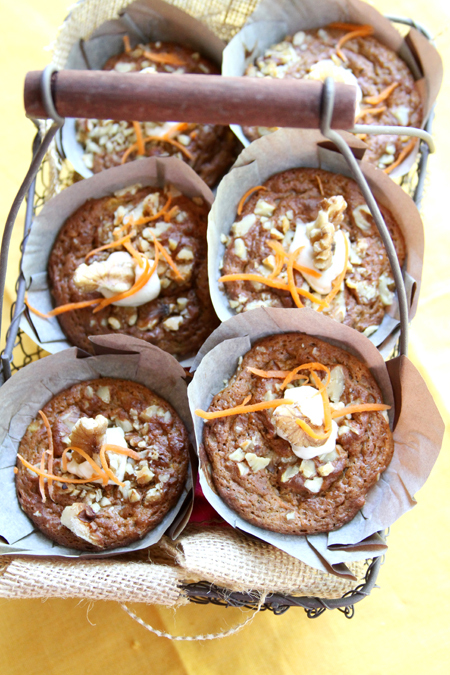 These carrot cake muffins were moist, just sweet enough, and one was very filling. When was the last time one cupcake could say it was that satisfying? This recipe is one of 13 healthier breakfast and brunch recipes in our original e-cookbook, Baker’s Dozen. Preview here, download for just 99¢ here, or order your printed copy here! 2. Grate the carrots and chop the pineapple, then set aside. 3. Combine all of the wet ingredients. Stir then add the carrots and pineapple. 4. Separately, combine all of the dry ingredients (except the walnuts). 5. Add the two sets of ingredients together and mix well. Pour in to 12 muffin cups and top with chopped walnuts. Bake 15-18 minutes. 6. 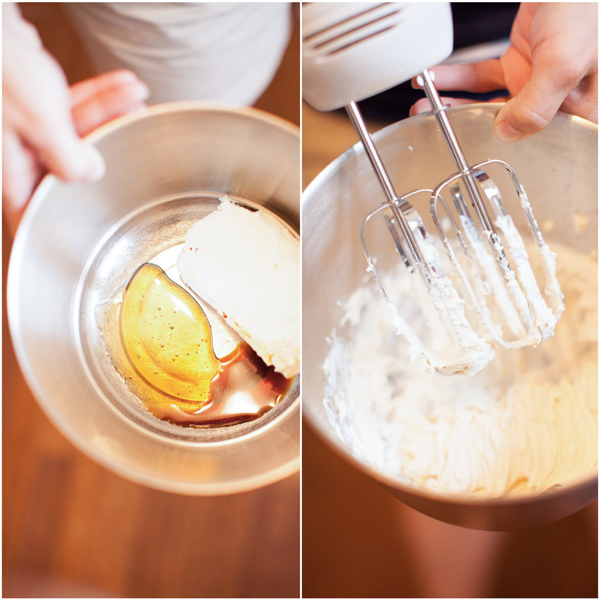 While the muffins are baking prepare the frosting by combining the ingredients with a hand mixer. Fill a piping bag (or use a sandwich bag) and refrigerate. 7. Remove the muffins from the oven. Once cool, use the back of a wooden spoon to poke a hole through the middles. Fill the centers with frosting and top with a whole walnut. Use a lemon zester to garnish with carrot strings, if desired.